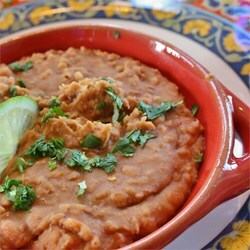 When you don't have all day to make refried beans and you don't like the canned ones, these are easy and delicious. Heat canola oil in a heavy skillet over medium heat. Cook garlic cloves in hot oil, turning once, until brown on both sides, 4 to 5 minutes. Smash garlic cloves in skillet with a fork. Stir pinto beans, cumin, chili powder, and salt into mashed garlic and cook until beans are thoroughly heated, about 5 minutes. Stir occasionally. Smash bean mixture with a potato masher to desired texture. Squeeze lime juice over smashed beans and stir until combined.